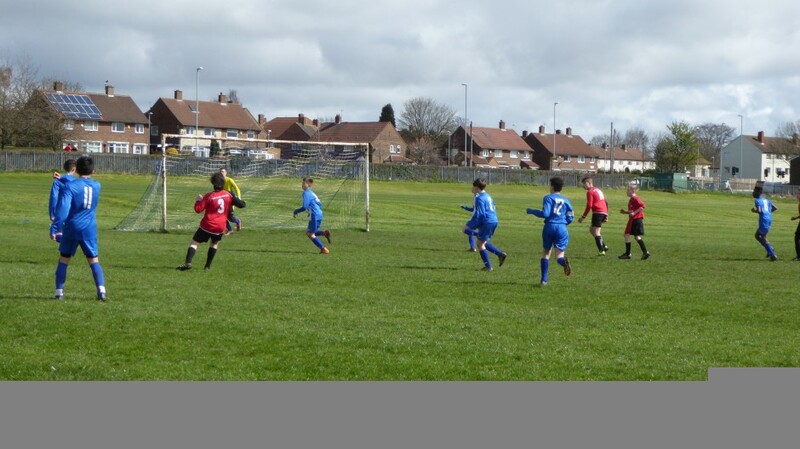 York U13s travelled to unbeaten league leaders Leeds. This was going to be a tough game made more difficult as the boys hadn’t played together for four weeks due to inclement weather. From the kick off Leeds were sharp and York had Leo Jones to thank for a timely block inside the 6-yard area within two minutes giving Leeds their first corner of the game. York responded well with Alfie Evans clearing the ball through to Harvey Stephenson in the York midfield who laid it on for Luke Jones who fired in a shot; but it was straight at the big Leeds shot stopper. The first ten minutes was end to end as both teams searched for the opener as Luke Jones saw his shot fly narrowly wide before Joseph Hodge was called into action pulling off, what was to be the first of many, magnificent saves to keep Leeds out. Yorks defence of Ben Rhodes, Olly Hanley, Alfie Evans and Leo Jones were tackling tenaciously to keep the Leeds attack at bay and when the York defence was penetrated the Leeds strikers found Joseph Hodge in top form pulling off some magnificent diving saves to keep the scores level at 0-0. Yorks two wingers, Liam White on the left and Connor Teale on the right, aided by Elliot Oliver and Harvey Stephenson in central midfield, were putting in a shift and trying to bring the Yok forwards, Ben Calam and Luke Jones into play; but found the Leeds defence well drilled and strong. 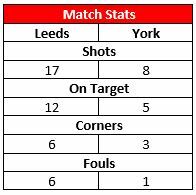 With Leeds dominating the last twenty minutes of the 1st half producing shots on goal the Leeds defence was resolute, snuffing out the York attacks. A corner delivered by Connor Teale was turned goal ward by Luke Jones but flew past the wrong side of the left upright, which left the half time scores at 0-0. Leeds kicking off the second half caught York napping as they went straight on the attack catching the York defence square for the Leeds striker to pass it past the onrushing Nathan Storr to go 1-0 within a minute of the re-start. This fired York into life with both teams now battling hard it was again end to end but this time neither team could break the other down as Jacob Caringella, Leo Jones, Olly Hanley and Alfie Evans in the York defence held firm with Nathan Storr Pulling off a great save in the 53rd minute to keep York in the game. This lead to York having their best spell of attack in the game with Liam White, Ben Calam both having shots saved by the Leeds keeper and Alfie Evans seeing his shot somehow saved from close range from a corner delivered by Harvey Stephenson. Liam White running at the Leeds defence, was causing them problems, and it was from one of these runs delivering a floated cross that was uncharacteristically dropped by the Leeds keeper allowed Ben Rhodes to score his first goal for York Schoolboys, with lightening reactions beat the Leeds keeper and defender to the loose ball to poke it in at the far post making the score 1-1 in the 57th minute. Minutes later a corner delivered by Ben Calam found Luke Jones in the penalty area and after skipping past a packed Leeds defence was unlucky to drag his shot narrowly wide of the right upright. With minutes remaining and both teams looking for the winner a lapse of concentration allowed the Leeds attacker through on goal with only the keeper to beat saw his shot palmed away by York keeper Joseph Hodge; but unfortunately this fell to a second onrushing Leeds striker who calmly slotted the ball into the empty net making it 2-1 at the final whistle. Managers Comments (Alan Oliver / Neil Stephenson): A great performance by all on the day. Showed a lot of character against a strong unbeaten Leeds. Leeds said that had been their hardest game all season. We were unlucky not to come out with something from the game but let’s use this experience for our semi-final next week. Men of the Match was awarded to Joe Hodge for 3 magnificent saves.